Universal beams offer added strength as a result of their shape. Image by Bbanerje, used under the CC BY-SA 3.0 license. Known in Australia as universal beams (UB) and universal columns (UC) but also commonly referred to as I beams and H beams, these are named after the I and H shaped appearance of their cross section. 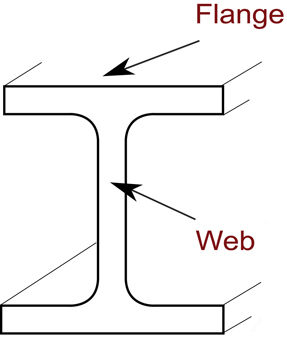 The vertical middle section of the beam is known as the 'web' and the horizontal components are called 'flanges'. These beams are designed to support a lot of weight in one direction. UBs used in floors will support more force vertically than a standard square beam, but are weaker against horizontal movement and do not react well to twisting. They are used as a component in floor framing, and can be used with other beams and joists where extra load bearing capacity is required. What are universal beams made of? The material most commonly used to make UBs is hot or cold rolled steel, but other materials such as aluminium and even particleboard are beginning to gain popularity in the market. Are there variations in universal beams? Variations amongst UBs include material, length of the web and the depth of the flanges. Different weight loads and areas will require different measurements on the beams; the longer the web, the more force it can stand up and down, the wider the flanges, the more side to side movement the beam can withstand. Wide flange beams are also known as W beams. How are universal beams installed? UBs are used in steel and occasionally wood frames where additional weight support is necessary. The frame should be designed with these beams in mind, as their shape requires different construction techniques and machinery for their installation. It is critical that these beams not be used in any torsion bearing loads, as twisting can warp the beam and rupture the floor. UBs can be found just about anywhere heavy duty weight support is required. They often support the main structure of a house and are commonly used under load bearing walls. They cost more to manufacture than a wooden beam, but provide great advantages in terms of strength.